I love finding new, high-quality, affordable makeup so I was excited to try out some different products from Rimmel London. I was certainly not disappointed. The Scandaleyes Rockin' Curves Mascara is a non-clumpy formula that really made my lashes pop. The brush is shaped so uniquely so it allows you to coat and separate every lash for maximum volume. Moving onto the lips, I tried out the Moisture Renew Lip Liner, a clear line that moisturized and provides a smooth base for the Moisture Renew Lipstick. I loved the lipstick color they sent and when applied over top of the liner, it stayed even and vibrant! Dry skin can be painful and uncomfortable, especially in the dry winter weather. So a good moisturizer that both prevents and heals damaged skin, is so important. Jergens is a trusted lotion brand and the Ultra Healing line seals in the hydration for 48 hours after application. In fact, Jergens claims that you'll see healthier, softer skin in just 1 week! I've been keeping this little guy in my purse at all times. Damaged hair can happen so easily. When each strand is exposed to different weather conditions, constant brushing and everyday heat, it can become broken, dry and unhealthy. So thank goodness for hair treatments like this one. Clairol's new hair mask is easy-to-use; in the shower, it moisturizes and conditions your whole head, leaving you with smooth and healthy hair! Puff's plus is my go-to tissue brand. It's been around for years and has helped me through many allergy seasons, winter colds, and of course, sad movies! But now Puff's has a soft pack that is lightweight and convenient. I can stuff it into a duffel bag, throw it in my purse, or keep it in my car! Softness inside and out! Mmmm, there are few things better than hot cocoa on a chilly day. And this Swiss Miss brand is everything you would expect from a drink that brings back memories of snow days as a kid. It's simple, made with only 5 ingredients and no artificial flavors, colors or preservatives. Just add hot milk and this warm, chocolatey drink will take away all your winter blues! I had never heard of Resource Spring Water before receiving a bottle in my VoxBox. But I was glad to learn that it's 100% natural spring water with naturally occurring electrolytes. It tasted clean, crisp and refreshing. And even better, the large bottle is made with 50% recycled plastic and is 100% recyclable! What supplies do you use to get through the harsh winter weather? 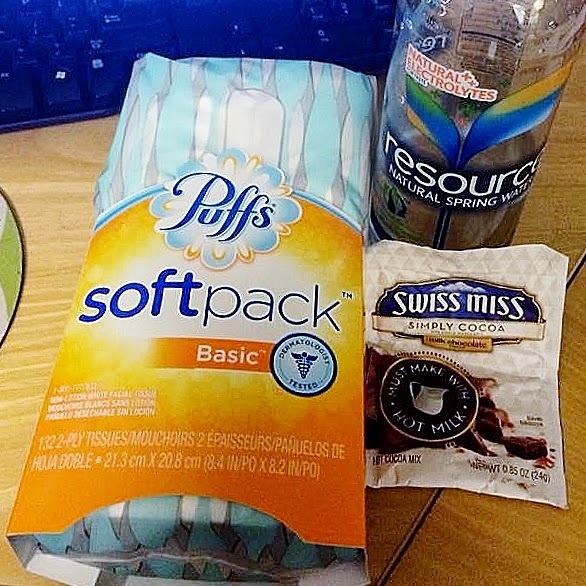 *I received these products complimentary from Influenster for testing purposes. All opinions and photos are my own.